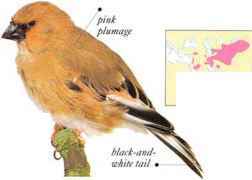 Renowned for its sweet "twangy" song, this species is a finch of open places, particularly gorse-covered heaths. Linnets become sociable in autumn and form huge, wandering flocks, which often move south. They feed mainly on seeds and sometimes on insects. • NEST a cup nest of grass and moss, lined and placed low in a bush or tree.